Chub Fish at Sellar's Cut, Providenciales. Underwater photography is one of the most difficult forms of photography, and the concepts, techniques and equipment can be a little overwhelming when beginning. The Turks and Caicos offers a wealth of marine settings, from vibrant reefs, to sandy channel and wetland environments, all teeming with life. The Turks and Caicos is an excellent destination to practice underwater photography and videography. There’s an amazing selection of reef sites and unique features to discover. Exceptional visibility and clarity is of course conducive to beautiful photos, and no location in the country parallels the exquisite West Caicos Marine National Park. Depending on weather conditions, the likewise beautiful Malcolm’s Road Beach coast on Providenciales can also be spectacular. 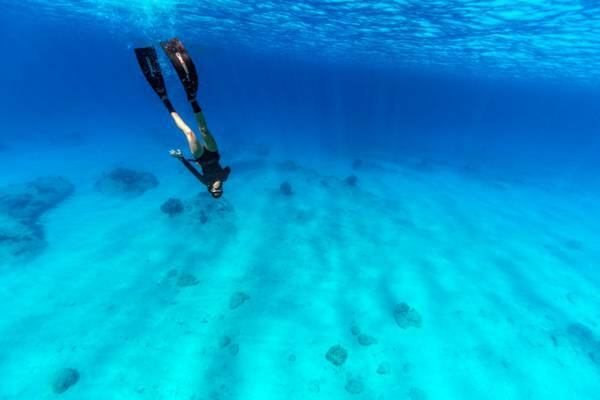 If you’re looking for easily accessible sites to simply practice at, the centrally-located Smith’s Reef and Bight Reef on Providenciales are the places to start. The Bight Reef is a single reef system that starts directly off the beach, and Smith’s Reef is an extensive collection of reefs and coral heads that offers a tremendous variety. 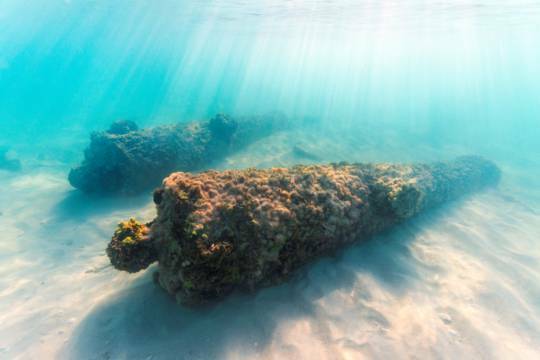 There are many sights and features that are perfect for overunder and unusual shots, including the famous La Famille Express shipwreck, the red mangrove estuaries of Mangrove Cay in the Princess Alexandra Nature Reserve, and the 1700s cannons at Fort George Cay. Last but not least, the shallow sea grass beds off the Bight Beach can also be fun. There’s an array of interesting wildlife, including eagle rays, stingrays, turtles, starfish, conch, and other gastropods. 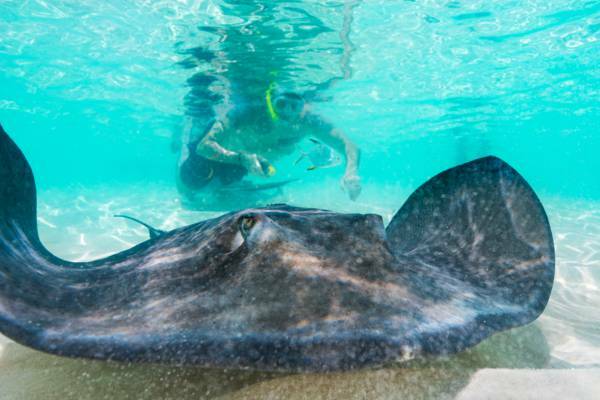 Snorkelling with the stingrays at Gibbs Cay. The most significant challenge in underwater photography is the blue and green color casts and the lack of reds, yellows and oranges in naturally sun lit water. This is caused by the longer, warm wave length colors being filtered out and scattered before the short blue wave lengths. Under full sunlight, this effect starts to be noticeable from about 10 feet (3m) and increases with depth. Although not always the case, greens are often caused by particles suspended in the water. Flashes (commonly called strobes) are the usual way to bring some of the true color back in photos, but due to the quality and flexibility of the images from some of the newer cameras, color filters and software correction are becoming more common instead of or in addition to strobes. Low light is another issue. It’s often quite dark under the water, especially when diving past 40 feet (12m). Traditionally, this has again been handled by strobe lighting, but newer digital cameras (more so with cameras with large image sensors) tend to be quite capable in such conditions. Because of sediment and particles in the water, low contrast can be another issue, although this is usually easily improved in post processing programs such as Photoshop. Slack high tide typically offers the best underwater visibility. Check the seals! Before taking your camera into the water, ensure that all the seals and catches are secured and functioning. Get close to your subject. Closer to your subject translate to less color and sharpness lost, and fewer particles in the water to cause problems. Use your Flash. Artificial lighting from your flash (even dive lights will help) brings back color, sharpness and contrast. Keep in mind that flashes lose their effectiveness underwater after quite a short distance. At subjects more than about 6 feet (2m) away, flashes won’t do much at all and will actually make your image look worse by lighting up particles between you and your subject. Try to keep the sun to your back. When photographing with ambient light, keep the sun behind you to avoid blown out highlights and excessive shadows. Try to keep your shutter speed up. Blurriness due to subject and camera movement is a common problem with underwater images. Shooting at a minimum shutter speed of 1/100 will greatly increase your number of keepers. Take care of your camera. Be sure to rinse your camera after underwater use and don’t leave it in direct sunlight. Inspect seals for sand. Taking care of your equipment ensures that it will function as long as possible. Take a lot of photos. Large memory cards are very inexpensive today. Lots of things can negativity effect underwater photos, so having more images to pick through can make a big difference. There are three basic directions to go when choosing an underwater camera. Before purchasing, decide if you simply want to record your adventures, or pursue high technical image quality. Serious underwater photography can be time and money consuming. Waterproof digital compacts are the simplest and usually the least expensive option to get into underwater photography. These cameras are designed to be waterproof (and usually impact resistant) and are typically very compact and easy to operate, but they have quite a few downsides. Durability and camera life is the major problem, as even with careful cleaning after every use, use in salt water almost always causes corrosion and eventual seal and camera failure. This isn’t an issue for a short vacation or limited underwater use, but a camera with a separate specialty housing is a better choice for dedicated use in sea water. Another issue is image quality. These types of cameras often have very small images sensors, which usually translates to poor low light performance, causing blurriness due to low shutter speeds and graininess and poor details. These cameras often have flashes that can be used underwater to good effect in clear water. In water with lots of sediment and particles, however, flash photos will have a lot of bright spots due to reflections because the flash and lens are very close together. Although sufficient for snorkeling and most watersports, the depth rating for these cameras is often unsuitable for most diving. Compact digital cameras with separate underwater housings are the most common underwater option and can be quite capable. Varying in size, this broad category generally includes all non-waterproof and non-changeable-lens digital cameras in an appropriate underwater housing. A main consideration when going the route is system cost. Housings usually cost as much as the camera it’s designed for, and often can’t be used with any other model. Before purchasing, determine if you are putting money in the right camera. One of the least expensive options in this category, a GoPro with the usually included underwater housing is an excellent choice if you just want a record of your dive, as the cameras are compact, lightweight and simple to use. Generally, larger image sensors and wider zooms are desirable for underwater. Additional underwater strobes can be set up to work with many compact digital cameras, and they are usually triggered by the cameras built in flash. Interchangeable lens cameras with specialty housings are generally the choice for serious underwater photographers, offering far better technical image quality than the previous two categories. Several manufacturers produce housings, including Ikelite, Sea & Sea, Seacam, Aquatica, Nauticam, and Subal. You’ll get the most options when shopping for the popular Nikon and Canon DSLRs rather than other less common brands. It’s important to research the subject a bit before buying this type of system. Lenses that work well out of the water may not do so underwater. Entry price is about $1,000 for a basic housing, but high-end and advanced systems (housing for camera, specialty port for lens, strobes, accessories) can easily get past $10,000. As with any equipment used in salty ocean water, proper care is critical for camera life, regardless of camera type. Typically, soaking your gear in fresh water after use is recommended. Housing seals may have to periodically lubricated with a specialty silicone grease. Read your manual and follow the manufacturer’s instructions. Underwater camera choice on Providenciales is unfortunately limited to two options: rental of an underwater camera from a dive company, or the purchase of GoPro with an underwater housing (available from a few watersports shops in Grace Bay). The other islands in the country really don’t have any options.